I`ve been thinking a lot about the latest oil has it continue to crater. Are falling prices reflective of oversupply or weak demand? What are the implications for the global growth outlook? On one hand, its weakness could be attributable to excess supply due to a Saudi decision to continue producing for economic and political reasons. In that case, falling oil prices are bullish for the global economy as it represents a transfer of wealth from producers to consumers. As consumers spend more, it spurs economic growth. On the other hand, the prices of other commodities have fallen in lockstep. In that case, a better explanation for commodity price weakness would be falling global demand, which would be bearish for the global growth outlook. As the above chart shows, both oil prices and commodities, as measured by the CRB Index, have cratered. Is this a warning of sputtering global growth and deflation, which is a deflationary signal for investors to dive into their bunkers? Well, 2005 — which marked the real start of the bull run — was the year US interest rates started to be increased. US housing prices peaked the same year, and it was also the year that the issuance of securitised mortgage backed securities was at its record highs. I postulate that even though interest rates were on the rise there was a type of vicious circle in the investment world. A shortage of high-yielding safe assets and the sudden under performance of the housing market created a real incentive for a new asset class to be created. One of the key factors behind the housing boom was the idea that house prices could only go up. If you borrowed to invest in a house you were securing your future wealth. 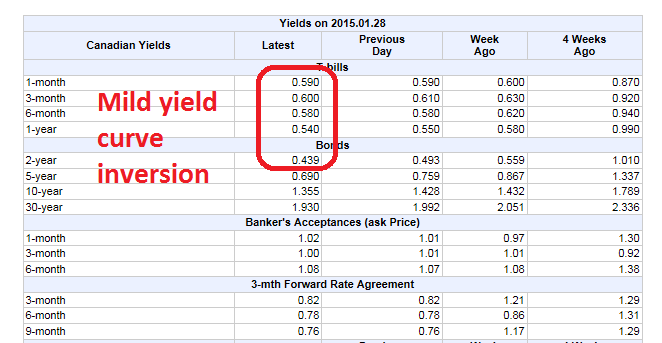 Problem is those rates were not affordable once interest rates started to rise. Rising interest rates not only killed the mortgage security pipeline and impaired existing assets — adding to the collateral/asset shortage — it suspended the securitisation and financialisation of housing. Without new financialised inflow, high house prices could no longer be sustained, and a correction took place. The correction was like a self-enforcing negative spiral, wiping out ever more safe assets from the system. Which is when the commodity diversification narrative began to be trumpeted in earnest. This is logical if you consider that a lot of money which wanted a fixed “safe” income was now looking for a new home and looking for another relatively scarce asset to take the place of housing which could only go up. Commodities were a natural fit. The really important point, according to Yetsenga then, is that even though demand indicators suggest physical oil demand has risen (albeit at lower rates than in recent years) global growth expectations have come down and bonds have rallied. What’s also important to note is that this is not just an oil story. 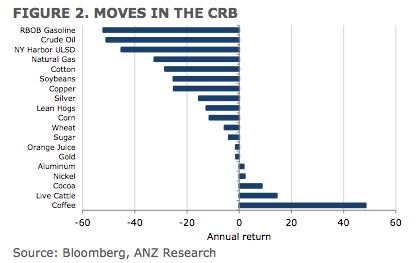 In the CRB index, for instance, only 5 of the 19 components are up over the past year. And of the 14 that fell, only 4 fell less than 10 per cent. This suggests to Yetsenga that there is a common factor affecting all of these commodities: financialisation and the emergence of commodities as a financial asset which benefit whenever cheap dollar funding is available, and fall whenever dollars become expensive. In other words, if commodity prices rise purely because of financial flows, then presumably that is akin to an exogenous reduction in physical supply. It is a tax. But consider the broader perspective. If global financial conditions are loose, and specifically here we are thinking of USD liquidity, then that would actually be boosting financial conditions and hence global growth, at the same time as there was leakage into commodities. Viewed in this context, the rise in commodity prices through the 2000s was actually a positive development in that it reflected the beginning of a secular trend towards USD weakness and plentiful USD liquidity. On this front recall the hand wringing in the early 2000s when oil (shock horror) rose through USD40 a barrel — a point at which Asia was widely presumed to face rocky times. Of course oil prices ultimately went to four times that level, and any notion that oil was a big issue for Asia at levels that were historically normal was progressively discredited. Consider now the current cycle. If oil and other commodity prices are falling because global USD liquidity is increasingly restricted, then it seems difficult to interpret that as a growth positive development. In fact, it seems perfectly consistent with growth expectations being under some pressure and global bonds rallying. In short, think of the emerging world in the same position as Greece in the eurozone: dependent on a currency it can’t control access to or supply of. And that’s a problem because, those who have the commodities to sell to emerging countries are obviously still not prepared (as yet) to accept anything other than dollars in exchange. Which means the only way the problem can be alleviated is if the US continues to subsidise global growth by means of providing it with the cheap liquidity it needs to keep growing. Alternatively, of course, for commodity producers to start accepting a currency that these emerging markets have easy access to. For momentum oriented investors, these conditions suggest that commodity related investments should be avoided until we see signs of stabilization. As for the concerns about declining demand, there is an indirect and somewhat imperfect way of measuring the effects of commodity de-financialization. The chart below shows the price of industrial metals, which is highly sensitive to global growth, compared to Emerging Market equities. The bottom panel shows the rolling 52-week correlation between the two price series. The two had been highly correlated, but their paths started to diverge in early 2013. That divergence gives us a clue to the magnitude of the de-financialization effect. 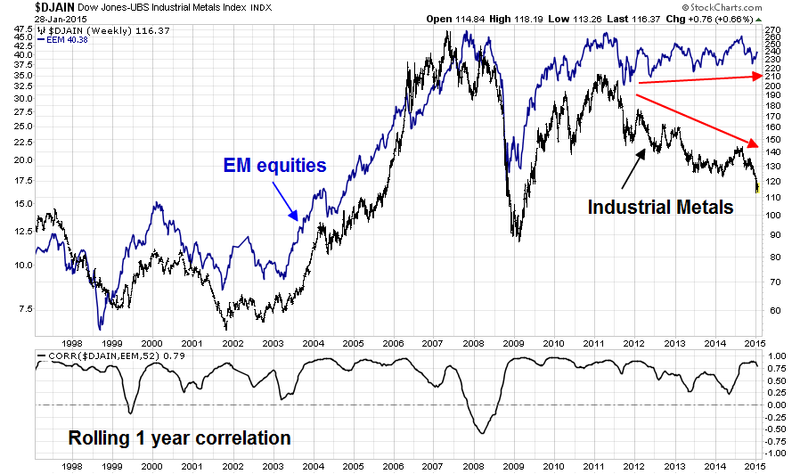 This chart shows the relative performance of EM equities (EEM) relative to the MSCI All-Country World Index (ACWI). EEM remains in a relative downtrend after having probed the relative support levels seen during the Lehman Crisis lows. It is currently staging a minor relative rally and may be trying to turn up, which is a hopeful signal for global growth. Another way of analyzing the de-financialization effect is to filter out the effect of USD strength. As commodities are generally priced in USD, a rising USD poses a headwind for commodities. The chart below shows the CRB Index, priced in EUR. As the chart shows, the euro denominated CRB remains in a downtrend, which is a bearish signal. Oil price weakness is not just a supply issue, commodities are weak across the board. Commodity prices were buoyed by financial demand, but that process is reversing. Net of the financial demand, the commodity complex is still signaling global weakness, but the picture is mixed and there are hopeful signs that the growth outlook is bottoming. I am not panicking just yet, but I am watching these other signals (EEM vs. ACWI, commodities priced in euros) carefully for signs of global growth upturn (or further weakness). The parents fight and the kids hear everything. The younger, more naive ones, think that the parents are on the verge of a divorce, but nothing could be further from the truth. Today, we have a couple of "fights" occurring in Europe. First, there is the electoral win by Syriza in Greece, whose platform is to reverse the painful austerity imposed by the Troika (EU, ECB and IMF). As well, there is the news of German unhappiness with the ECB as it announced its QE program. It seems to me that all of these so-called "fights" are more of the usual European theatre that can be ignored. Despite the alarmist rhetoric, the union remains sound. He said his government would seek a mutual solution that would allow the country to emerge from its mountainous debt and pledged to to make good on his party’s promise to curb the corruption that contributed to Greece’s debt crisis in the first place. 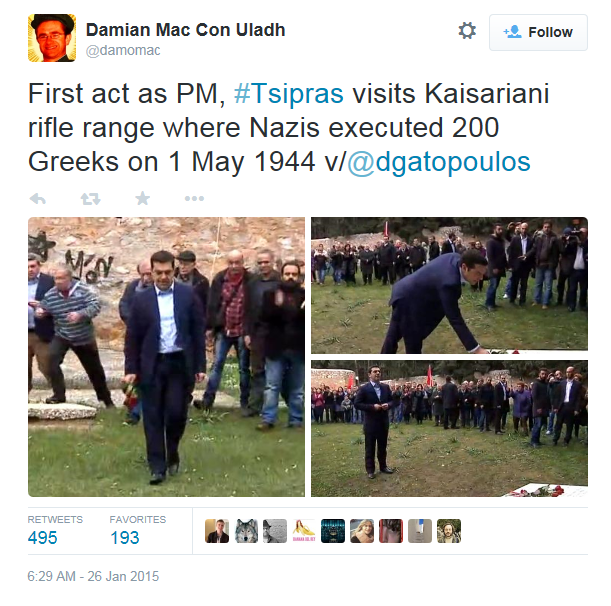 “Today the Greece of the oligarchs, of the elite, of the cover-ups was defeated. Victory was for the Greece that strives, that hopes,” he said. First, there’s the matter of new and unfunded government expenditure in the Syriza manifesto. Who knows what would eventuate in the coalition-formation process, but they are not currently affordable [ie they would bust the primary surplus on their own]. Second, as the FT reports, tax collection is plummeting right now as Greeks forecast that unpopular property and other taxes will be ended, and perhaps also that there will be less appetite to collect on legacy obligations that the new political leaders discredited. Ironically, this drop in tax collection reduces Syriza’s ability to deliver on the promised goodies which will win them the election. In other words, the primary budget surplus is likely to substantially disappear once the new government takes over. Notwithstanding these problems, the new government is holding a weak hand when bargaining with the Troika. Everyone knows it. Cut adrift from the Troika, the Greek government does not have the funds to stand behind its own banks. They would be left insolvent by a Greek default [economically, they are already, really]. A run on Greek banks, either prompted by default or the threat of it, could not be stemmed by a credible guarantee of deposits. The primary surplus would fast disappear as the contraction in money, credit and economic activity played out. The German government stuck to its view on Monday that a third haircut, or debt restructuring, for Greece was out of the question but opened the door to a possible extension of Greece's current bailout programme. "That's certainly a possibility or an option and, as I said, we'll go into every discussion constructively ... As always, it depends on how such a request is formulated and on the overall context, but in principle that is an option," German finance ministry spokeswoman Marianne Kothe said at a news conference. In other words, no bailout, but we are open to negotiation on an extension. However, that kind of loan modification amount to a form of debt haircut on a net present value basis. It's only a question of semantics. Imagine that you are owed $1 million and the debtor offers you a deal where he pays you $1 a year for the next million years. Is that debt relief? The troika itself does not use Ipsas in calculating Greek debt, but rather what is confusingly called the Maastricht definition of debt, which is based on face value. The fact that Germany has acted as a vigilant gatekeeper over Greece’s agreement to abide by the agreed debt and austerity measures should deserve scrutiny. Look again at the 57 billion euros ($66 billion) in German loans through the lens of accounting logic. 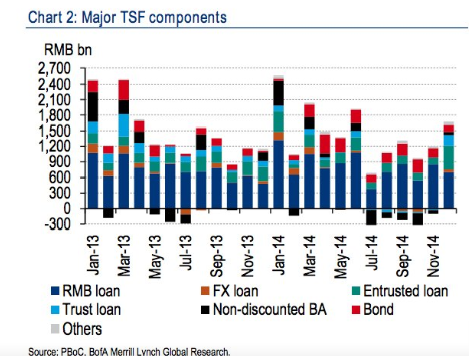 The loans have been made at under 2 percent with maturities as far out as 2054. That means that, in reality, the interest on this loan is under market rates. Giving loans well under market rates with gaping repayment schedules amounts to a grant. According to Ipsas standards on German debts, this portion of the debt alone would require only about 13 billion euros ($15 billion), leaving Germany with a considerable 44-billion-euro ($51 billion) loss. The EU has already had a history of giving Greece debt relief in the form of below market interest rates. The key question in the upcoming negotiations is how much more while maintaining the fiction that the face value remains unchanged. But in light of Europe’s underlying problems of stagnant growth, high debt and rigid labor markets, ECB President Mario Draghi suggested the central bank’s largess alone won’t be enough to right its economy. Jeremy Warner of The Telegraph, which is a newspaper notorious for anti-Europe views, outlined a nuanced analysis of the current disagreement. While Mr Draghi was announcing his QE, Angela Merkel, the German Chancellor was coincidentally making a vitally important point to Davos participants; Germans might feel uncomfortable with money printing, they might further worry that it will ease the pressures for reform among profligate eurozone members, but the central bank is independent and must pursue its mandate in whatever way it sees fit. People often attribute this aversion to money printing to German experience of hyper-inflation in the Weimar Republic.But in fact it’s as much about something even more deeply ingrained in the German psyche than fear of inflation - teutonic obsession with legality and rules. It was the idea that QE might be illegal under treaties as much as concern about monetary ill discipline that led Germany to resist QE for so long. The other reason was an overtly political one which really should have had no place in an independent central bank. It is that QE might provide the Mediterranean states with the space to go easy on structural and fiscal reform. This is a legitimate concern, but it is one for the politicians to address, not the central bank, a truism that the German Chancellor seemed to recognise in her remarks. Warner has a point. Much of the history of the ECB response to the financial crisis has been to craft solutions that follow the letter of the law, but bend them in such a way to satisfy its objectives. Viewed in such a context, the so-called Berlin-Frankfurt schism is nothing but a tempest in a teapot. There are tensions in any marriage, but this spat amounts to nothing more than "Your brother is a bad influence and I want to you to keep him away from the kids" kind of disagreement. So is it any wonder that after the carnage of the First World War and the Second World War, the countries of Europe came together and said, "Enough!" Thus, the EEC and later the EU was born. Today, that project has largely succeeded. We have seen no major European conflict since 1945, the end of the Second World War. The formation of the European Union has kept the peace. The political elite of Europe, despite all the bickering, are still committed to that bigger than life myth of the formation of the EU. For overseas analysts who look at Europe and only focus on the cost of bailing out Greece, Portugal, etc. Don`t ever forget the political glue that holds Europe together. Mom and Dad are fighting and the kids hear everything, but they aren't going to split up. The (European) union remains strong and it will muddle through. In practical terms, the chart below of the relative performance of Greek stocks to eurozone stocks show that Greek stocks are at or near past crisis lows on a relative basis. Expectations are already very low. Current conditions may represent an entry point into Greek equities for value-oriented investors. It has become harder for me, because the importance of my skills is receding. Part of my advantage, is that my strength is economic forecasting, but that only works in free markets, when markets are smarter than people. That’s how I started. I watched the stock market, how equities reacted to change in levels of economic activity and I could understand how price signals worked and how to forecast them. Today, all these price signals are compromised and I’m seriously questioning whether I have any competitive advantage left. I am neither a billionaire hedge fund manager nor am I Warren Buffett`s partner, but I recognize that the Trend Model may also be "all washed up". That`s because current market conditions are not conducive to the Trend Model adding very much value. The underlying premise of the model is to spot developing macro trends and jump on them in order to capitalize on the "bandwagon price effect", Unfortunately, there are no trends at the moment. The chart below of the SPX in the last six months shows how the market environment has changed. Early in this period, the price trend of the market were long-lived. Starting about mid-December, the price swings got shorter and the magnitude of the moves were lower, which change the character of the market from a trending market (shown by the blue lines) to a choppy, whipsaw market (shown by the red lines). This is an especially challenging environment for trend following models and my inner trader has had to rely more on short-term sentiment and overbought-oversold models for his trading. The markets are experiencing powerful cross-currents, which can be highly treacherous if someone is positioned in the wrong way. Current conditions are suggestive of a range-bound stock market - at least we start to get more clarity on how fundamentals are developing. 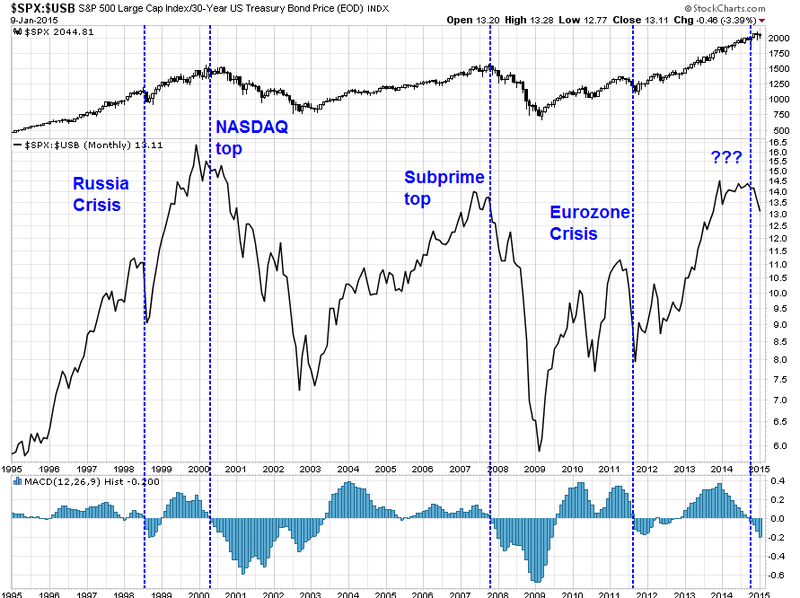 Until macro trends start to stabilize, I urge my readers to pay minimal attention to Trend Model readings. This model is "all washed up", at least for the moment. To explain my thesis for a range-bound market, I believe that the market is being pushed and pulled by both bullish and bearish forces, neither of which is able to consistently gain the upper hand. The result is a choppy up and down market, depending on which camp is dominant at the moment. First, let`s start with the bull case. In my post last week (see The global deflationary storm is abating), I indicated that macro trends were improving from "bad" to "less bad". Indeed, if you tour the global markets this week, that seems to be the case. Despite the ups and downs of the US equity market in January, the SPX managed to rally above its 50 day moving average this week and it is in a minor uptrend. On Thursday, the world held its breath and waited for the ECB decision. Mario Draghi did not disappoint with the size and the scope of the QE program and the European markets melted up in response. As the chart below shows, Euro STOXX 50 staged a mult-year upside breakout. China was also showing signs that it is reflating. 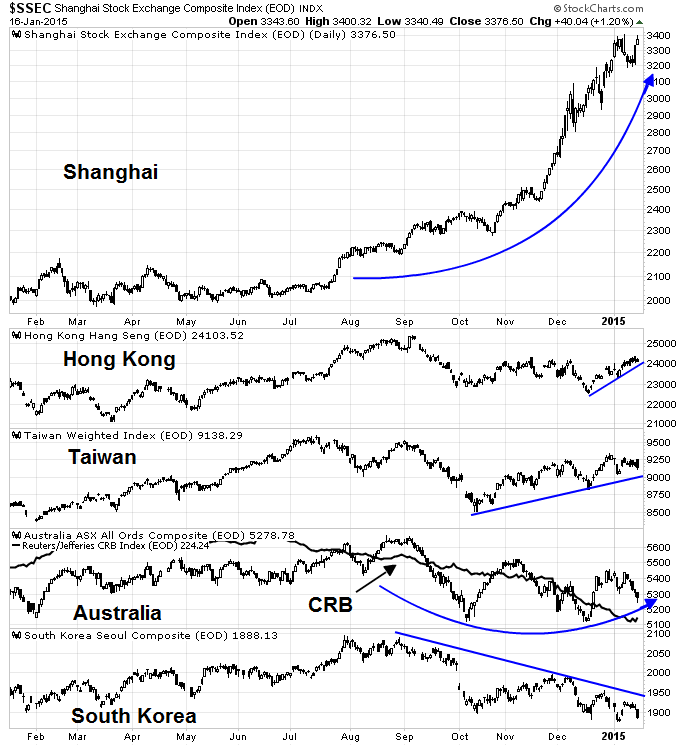 Notwithstanding the casino-like atmosphere surrounding the Shanghai market, three of the four of the regional bourses that I monitor staged upside breakouts, indicating better optimism about the regional and global growth outlook. The fourth, which is the South Korean KOSPI, has rallied to test a downtrend line and, given the powerful regional bullish forces at work, may break out next week. In short, global assets were enjoying a surge in risk appetite and the bulls were clearly in control of the tape. Despite the rejoicing over the latest party thrown by Mario "whatever it takes" Draghi, ominous dark clouds were gathering. In the past few months, the US economy had been seen as the engine of growth while non-US economies sputtered, it may be the turn of the US to pause and catch its breath. 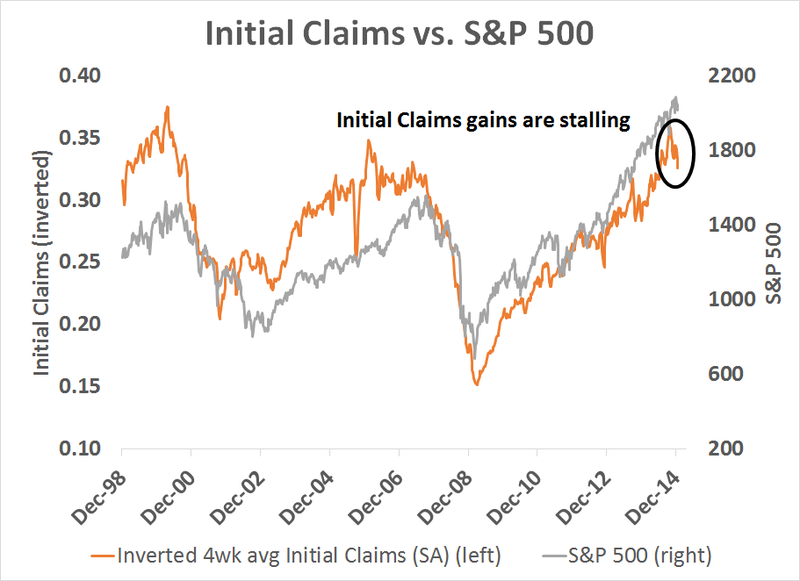 Cracks are starting to appear in US earnings reports, employment and technically. The misses were much worse than the beats. Even though there were many more earnings beats than misses, the magnitude of the misses were much worse than the beats. The aggregate earnings growth rate is disappointing, largely because megacap stocks tended to miss EPS estimates so that, on a capitalization weighted basis, these misses pulled down the aggregate growth rate. The worse culprits were the large cap banks, which virtually all missed Street expectations. The combination of these effects led to significant downgrades in aggregate SPX forward EPS estimates - which creates a significant headwind for US large cap stocks. I had suggested in the past that the strong USD effect was creating a drag on large cap multi-national companies and mid and small cap stocks, which had better US domestic exposure, was a better place to be (see Focus on small caps in 2015). Unfortunately, this may not be the case. Analysis from Ed Yardeni show that forward earnings for small and mid-cap indices are declining as well. 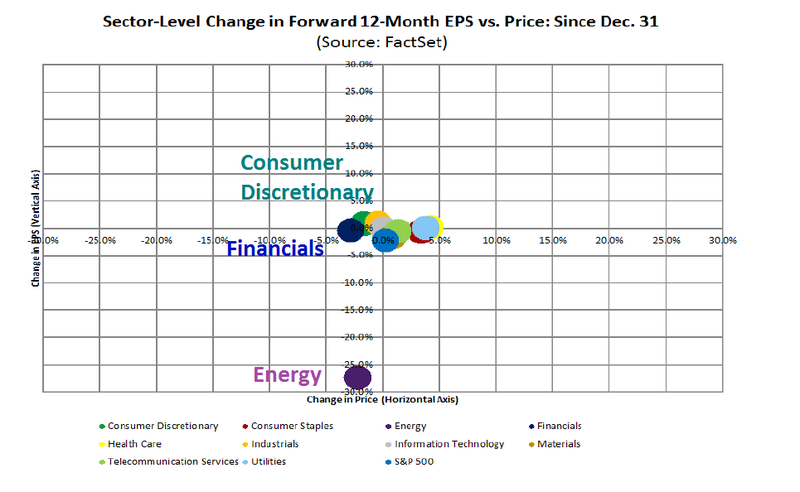 Forward EPS weakness is concentrated in three sectors: Energy, Financials and Consumer Discretionary, as shown by the chart below (via Factset). These three sector make up roughly 36% of the weight of the index and it would be difficult for aggregate earnings to make significant headway with such heavyweights dragging it down. The presence of Consumer Discretionary stocks in the list was a big surprise as I would have expected that this sector would have been a prime beneficiary of lower oil prices. While it's still early in Earning Season, Factset reported that six Consumer Discretionary companies had given earnings guidance, with five negative and one positive. As well, this interview with Ali Dibadj of Bernstein Research indicated that better consumer confidence does not necessarily translate into better growth for Consumer Discretionary companies and that the benefits are much more focused on specific industries, such as restaurants. In addition to the stubborn headwinds posed by the lack of positive momentum from forward EPS estimates, another nagging worry I have is that employment may be starting to stall. 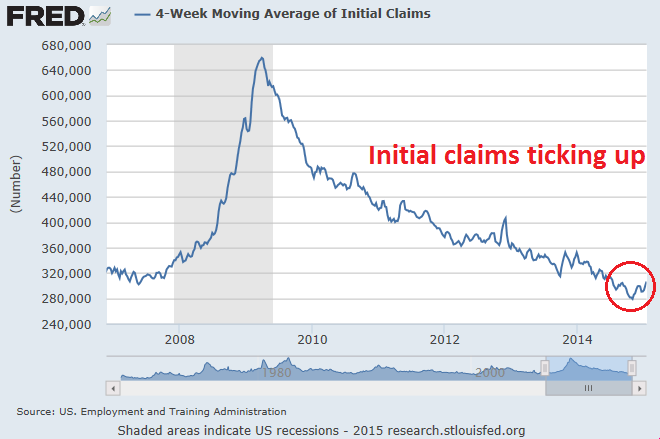 The chart below shows the 4-week moving average of initial claims, which seems to be ticking up. While the rise may just be data noise, it is starting to create a concern for me. 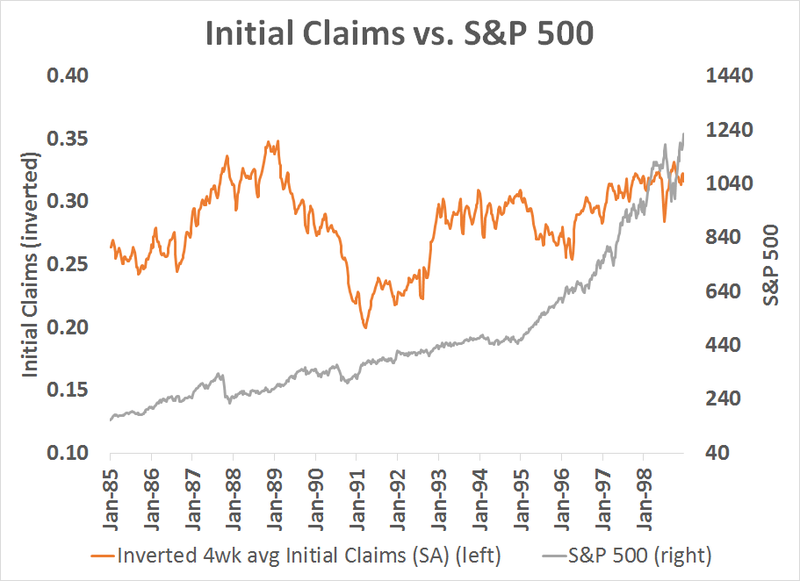 This chart shows stock prices have been highly inversely correlated with initial claims during this recovery. 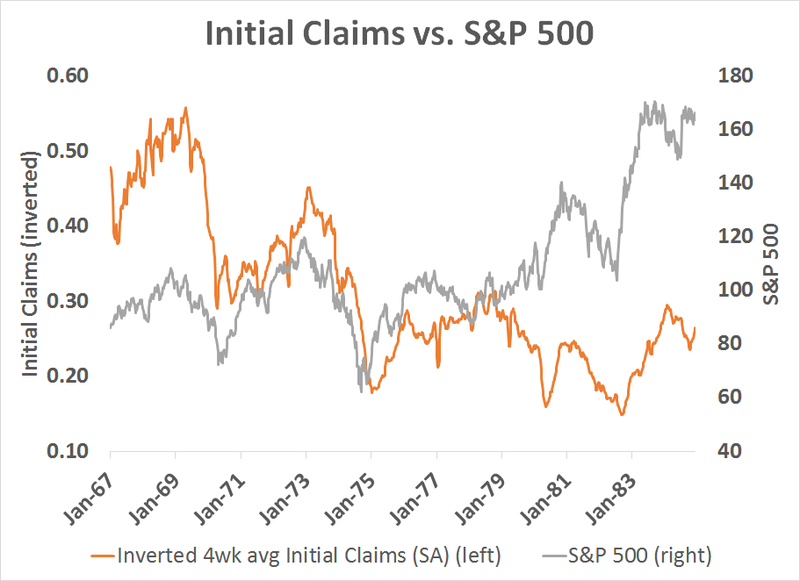 Should initial claims start to rise again, it could spell trouble for the economic growth outlook and therefore stock prices. My third source of bearish angst arise from the nature of the market leadership. The black line in the chart below depicts the relative returns of defensive sectors, Consumer Staples (XLP), Utilities (XLU) and Telecom (IYZ) relative to the SPX. 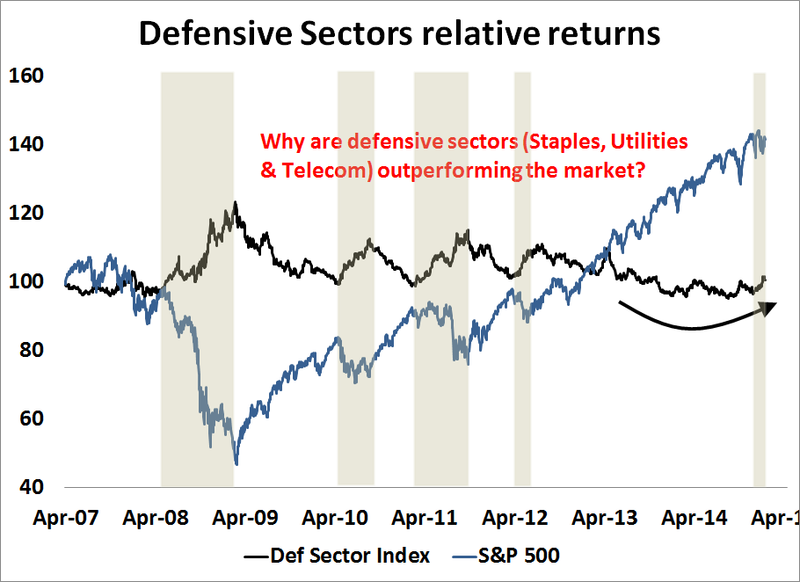 As the chart shows, defensive sectors have begun to outperform and past episodes (which are shaded on the chart) have been associated with either bear markets or corrections. When I put this all together, it is suggestive of a choppy range-bound market. While US equities are likely to enjoy the lift from global reflation effects from non-US sources, my base case scenario calls for a rally to test the all-time highs and a failure at about those levels as the bullish non-US tide diminishes as the major US indices face technical resistance. At that time, the bearish forces are likely to assert themselves and push prices downwards. Tactically, we are likely to see two major events with binary outcomes and possible sources of volatility in the week ahead. This weekend, we have the Greek election. As I write these words, roughly 95% of the votes have been counted and Syriza has won 149 seats, which is just short of the magic 151 seat count required for a majority government. They therefore need a coalition partner, which may imply some softening of their anti-austerity stance. The 10-year chart below of Greek stocks relative to the Euro STOXX 50 shows that these stocks are already approaching past crisis lows and therefore expectations are already very low. Even a minor positive surprise could cause European stocks to rocket upwards. 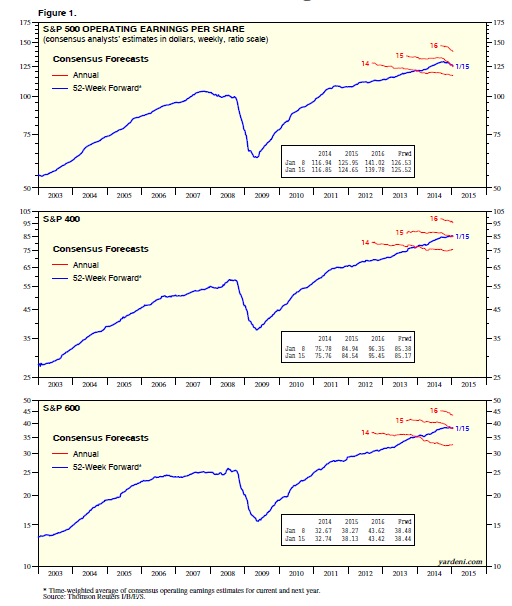 How often will the market consensus oscillate between (1), (2) and (3)? In addition, the FOMC is meeting on Tuesday and Wednesday and market participants will be scrutinizing the statement closely to watch for any change in language. While the market expectations derived from the futures market indicates that the first rate hike will occur in the second half of 2015, both Tim Duy and Jon Hilsenrath have suggested that the Fed is much slower to react and the base case seems to be a June liftoff for interest rates. If that is the case, the Fed could use January FOMC statement to "correct" market perceptions, which could create tremendous market volatility. Janet Yellen is leaving the Greenspan “put” behind as she charts the first interest-rate increase since 2006 amid growing financial-market volatility. The Federal Reserve chair has signaled she wants to place the economic outlook at the center of policy making, while looking past short-term market fluctuations. To succeed, she must wean investors from the notion, which gained currency under predecessor Alan Greenspan, that the Fed will bail them out if their bets go bad -- just as a put option protects against a drop in stock prices. Bill Dudley of the New York Fed outlined that approach explicitly and expects greater market volatility ahead. Investors should as well. My inner investor remains neutrally positioned at policy weight in stocks and bonds in his balanced portfolio. My inner trader is nervously long equities with tight stops and a higher than normal cash position. Subsequent to my last Trend Model trading system report card (see An excellent Trend Model report card: (Dec +7.8%, 1 year +40.9%)), I have been getting an increasing number of questions about the Trend Model. Instead of responding to them one at a time, here is the Frequently Answered Questions (FAQ) about the Trend Model. What is the Trend Model? The actual results of the account using the Trend Model trading system is a trading account. That account generally trades 3x leverage long or short ETFs on either the SPX, NDX or RUT. Total portfolio leverage normally doesn't exceed 2x. I have tried 3x total account leverage on a couple of occasions, but found that the volatility was beyond my comfort zone. As the Trend Model uses trend following principles and trend following models suffer from a drawback that they do not perform well in choppy sideways markets, I supplement the Trend Model trading signals with some short-term sentiment and overbought/oversold indicators in order to judge the market's upside/downside risk and return. For example, if the Trend Model has a bullish signal but the market is overbought, I would either pull back from a 2x levered long position to either 1x long or go to cash entirely. 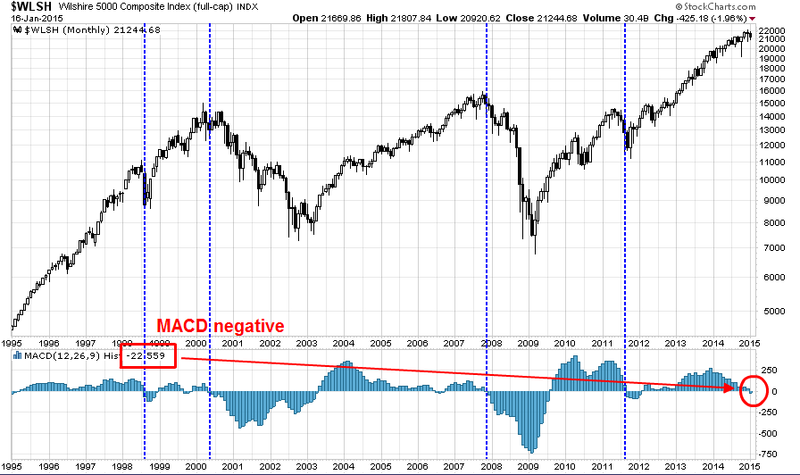 I generally do not override the Trend Model signal and take the opposite view. Can you tell me what the returns would have been if you had only used 1x leverage? Can you tell me what the returns would have been if you did not short the market? Can you tell me what the returns would have been in the year ____, when the market soared/tanked? I present the results of my trading account for informational purposes only. I am not offering any advisory or management service using the signals of this model. If such an event were to occur, it would be accompanied by the proper legal and regulatory disclosures. The purpose of the trading account is a proof of concept that the trading component of the Trend Model works. I have optimized the account in such a way that I believe maximizes the risk-reward ratio of this trading technique. I have no plans to backtest the model based on different conditions or different forms of implementation. If I were to offer either an advisory or management service and the funds are managed with different risk preferences as my trading account, its actual mileage will vary. When the markets get volatile, I often get asked question like the following: "You were bullish, now that the market has dropped ___, have you turned bearish?" I endeavor to update Trend Model signals on a weekly basis on Sundays and during the week on my Twitter account. You can get those updates by following me at @humblestudent. While I try to be prompt, I make no promises about the timeliness of updates. Remember that this is a free service. You get what you pay for. There is no service offered. However, I am in discussions with a number of different parties on how to best monetize the signals of this model. If an announcement is to be made, it will be done in due course. I received a fair amount of feedback to my post last week, A consideration of the bear case. While an intermediate term top is not my base case scenario, it is a possibility that we have to consider. Subsequent to that post, I am revising down the probability of a bearish outcome for stocks in 2015. First, let me recap that post. I showed this chart indicating the loss of positive momentum in risky assets, which suggested that most past episodes of momentum rollover have seen bear phases in the stock market. One criticism that I received was that I wasn't looking back far enough in my history. While the last 20 years is interesting, past instances of momentum rollover has not necessarily resulted in bear markets. The chart below depicts the SPX and its rolling 5-year rate of change. 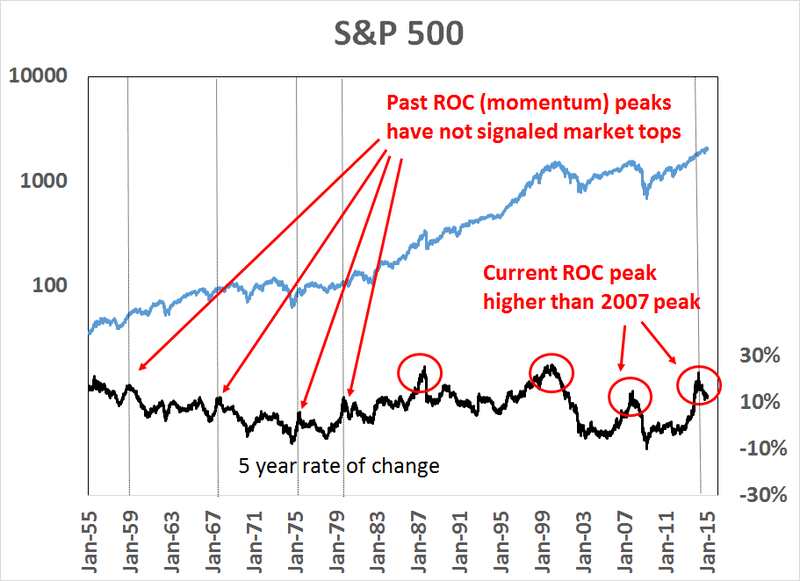 While the current ROC peak is higher than the 2007 peak and similar in magnitude to the NASDAQ peak, momentum peaks during the 1955-1980 period have not necessarily resulted in bear markets. I further argued that valuations are highly stretched. 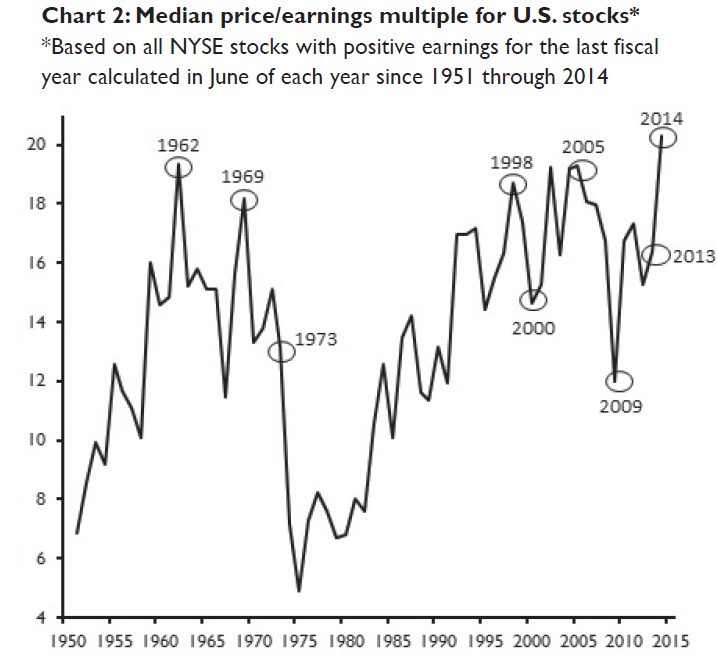 Paulsen at Wells Fargo Capital Management showed that median PEs are very high by historical standards. I would agree. 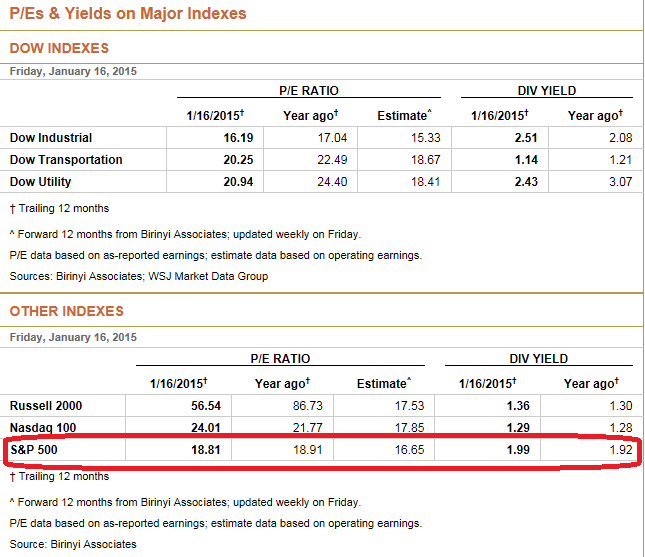 The WSJ shows that the SPX is trading at 18.8x trailing and 16.7x forward earnings. The market is not cheap. 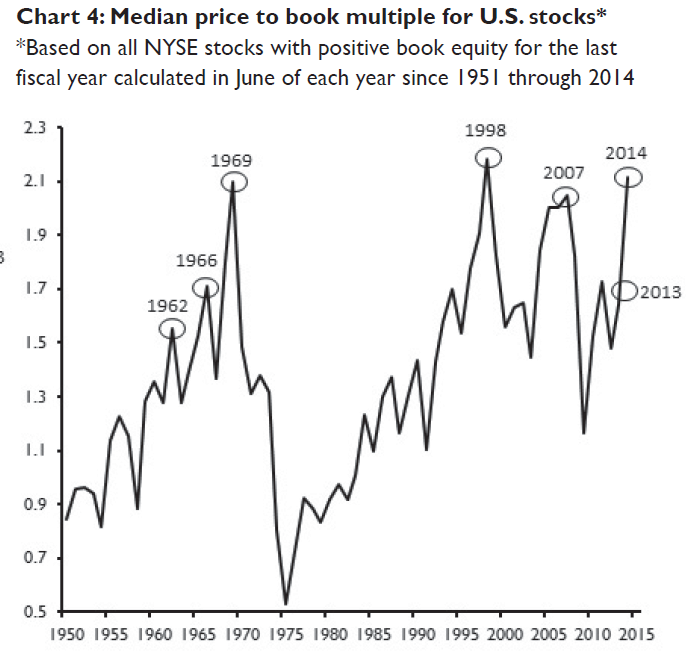 If past momentum peaks do not necessarily indicate market tops, but valuations are rich, what should investors think? The current environment suggests that EPS growth is the key to the market. As the Fed prepares to raise interest rates this year, don't expect gains from multiple expansion in 2015. Instead, we may see some multiple contraction. In the past, the Fed has only started to raise rates when it believed that the economy was growing fast enough to withstand the withdrawal of monetary stimulus. Such episodes have been associated with economic growth, which has pushed EPS to greater levels. In short, we need to see earnings growth for this stock market to go up. In my last post (see The global deflationary storm is abating), I voiced my concerns about this chart from John Butters of Factset. 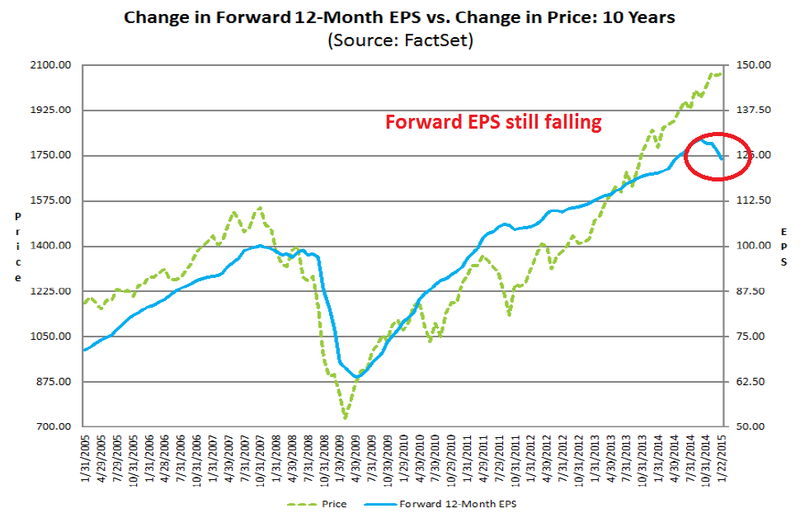 Forward EPS are still falling and past episodes of falling forward EPS have also seen either corrections or bear markets. Nevertheless, I remain optimistic. The American consumer is poised to come back strongly. The Gallup survey of economic confidence saw a surge in December, just as oil prices fell. In addition, a Gallup survey of life confidence showed that the personal life outlook of Americans is improving. More importantly, the uptick is occurring across the board in all income categories. The big question on everyone’s mind is: how does the oil price drop affect business? Unless oil prices turn around and head back to over $100, these circumstances should lead to better consumer spending and a pickup in employment. I also showed this chart of the relative performance of consumer spending sensitive sectors in yesterday`s post, which indicated that the market is expecting a consumer-led turnaround. Recessions do not start when the American consumer is resurgent. In the meantime, investors will have deal with the volatility that occurs during Earnings Season. Energy companies will see some EPS downgrades and so may large cap multi-nationals as they disclose the degree of headwind they face with a strong USD. Patient investors should be able to benefit from the benefits of higher consumer spending from a growing economy and lower oil prices. A better way to get exposure to this theme of a resurgent American consumer would be to tilt towards mid and small cap stocks, where the companies tend to do more business in the US rather than abroad (also see Focus on small caps in 2015). In my last monthly report card of the trading account that uses the trading model component of Trend Model, I stated that turnover averaged about 200% a month, which indicates that the typical holding period for a position is roughly two weeks. In the last two weeks, however, we have seen tremendous volatility in the US equity market. By the book, I would have had two or three signal changes in the trading model which flipped the signal from bullish to bearish and vice versa. The current environment exposes one of the weaknesses of trend following models - you need to have a trend in order to profit from them. Sideways choppy markets create whipsaw in trend following systems, with the resultant hit to the bottom line. To mitigate this effect, I have overlaid a number of short-term sentiment and overbought/oversold models to the trading model signal. These short-term models identify the risk and reward of being a bull or bear by seeking the answer the question, "Is the market overbought (oversold)? 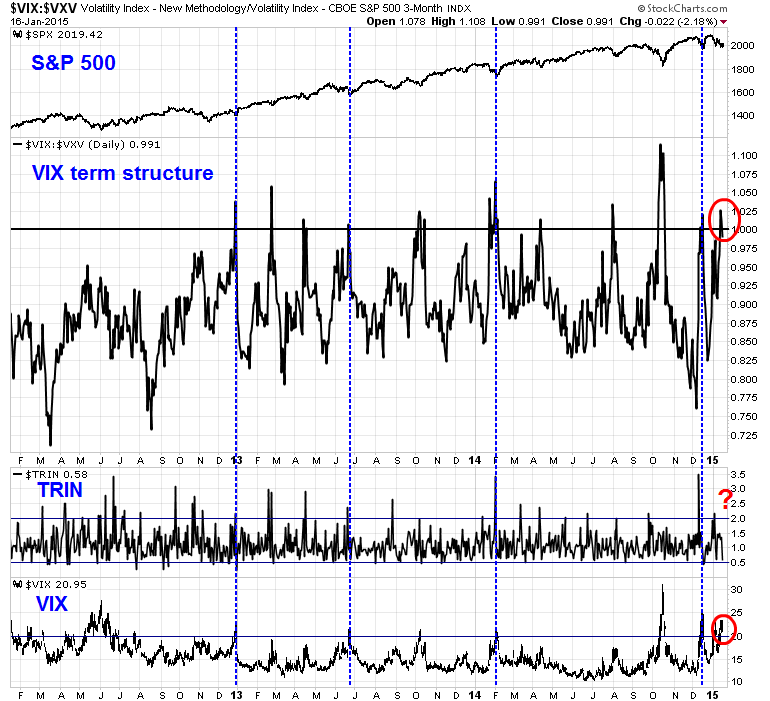 Are bulls (bears) in a crowded long (short)?" Despite the choppiness of the last couple of weeks, it seems that both the longer term trend and short-term trading models are aligning in a bullish fashion. The world is reflating and US equities are oversold enough that they are ripe for a rally. My framework of analysis has always been to focus on the three major trading blocs in the world, namely the US, Europe and Asia (or China). In my last post (see Decision time in the eurozone), I identified a wedge formation in the Euro STOXX 50 and I was watching for the direction of the breakout, largely because the markets were worried about global deflationary fears. The source of deflation was coming from Europe and, to a lessor extent, China, not the US. Therefore monitoring non-US markets made more sense. After I wrote that post, eurozone stocks resolved the wedge in a bullish fashion. A German government spokesman said earlier that Merkel and Draghi met on Jan. 14 for “regular informal talks,” while declining to comment on the topic. European bulls still have to contend with the hurdle of a Greek election on January 25. 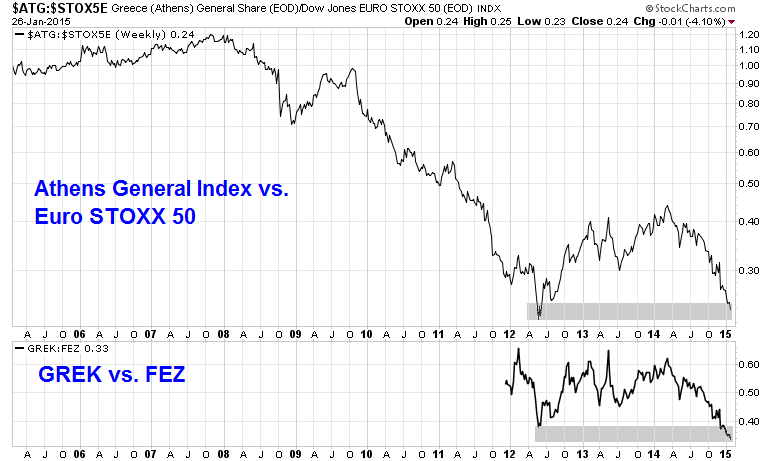 However, the chart of the relative performance of Greek stocks relative to the Euro STOXX 50 shows that this ratio is nearing the levels seen in the last crisis low. In effect, the market is already betting on a collapse. Barring the announcement of a Greek withdrawal from the euro, which is not in Syriza's electoral platform, how much more downside is there? While attention has been fixed on the slow down it seems the world has taken its eye off one of the most important figures in China — total social financing (TSF). After slowing all through 2014 it made a comeback in December. TSF is a measure that the Chinese government invented in 2011 to figure out how much debt non-state entities (like people and private companies) have taken on. Jim Chanos, founder of Kynikos Associates and on of the biggest China bears out there told Business Insider TSF is "still the most under-appreciated number in global finance." Why is it so important? Because it gives you a picture of the condition of both borrowers and lenders, and includes things like China's infamous shadow banking sector, where interest rates can hit 20%. As the chart below shows, TSF ticked up in December, which is suggestive of a near-term "less bad" scenario for Chinese growth. 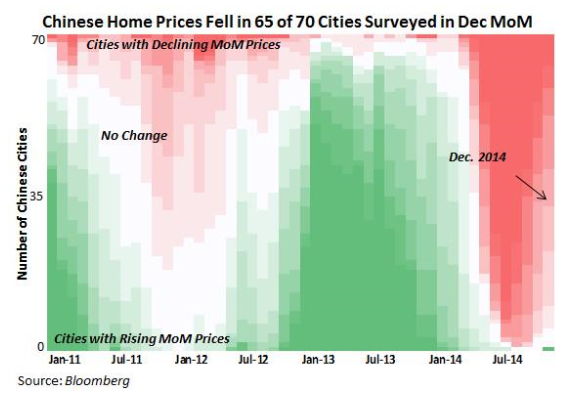 Indeed, the December 2014 survey of property prices in Chinese cities confirm this theme of "less awful" as we see a deceleration in the pace of decline when compared to November. A glance at market based indicators tell a similar story of improvement and turnaround. 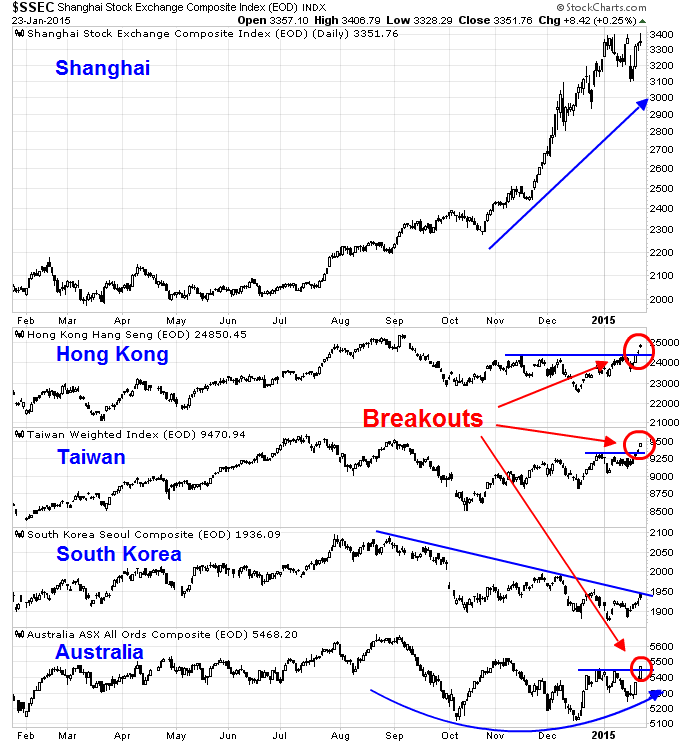 The chart below shows the stock markets of China and its major Asian trading partners. While the parabolic rise of Shanghai is likely a localized anomaly, much like the latest news about the authorities clamping down on margin account. The action in Shanghai can therefore be ignored. On the other hand, the stock markets all of the other Asian trading partner countries, with the exception of South Korea, are turning up. As China has been the major marginal consumer of commodities, commodity prices is another way of gauging the trajectory of Chinese economic growth. Despite the concerns expressed by many market commentators that cratering commodity prices stems from a lack of demand, which denotes slowing global growth, there are signs of hope. First of all, the above chart shows that the Australian stock market seems to be making a bottom, despite tanking commodity prices as measured by the CRB Index. The chart below of commodity prices and commodity-related indicators tell a constructive story of global growth. The top panel shows the prices of industrial metals, which are highly sensitive to global growth, compared to emerging market equities (EEM). 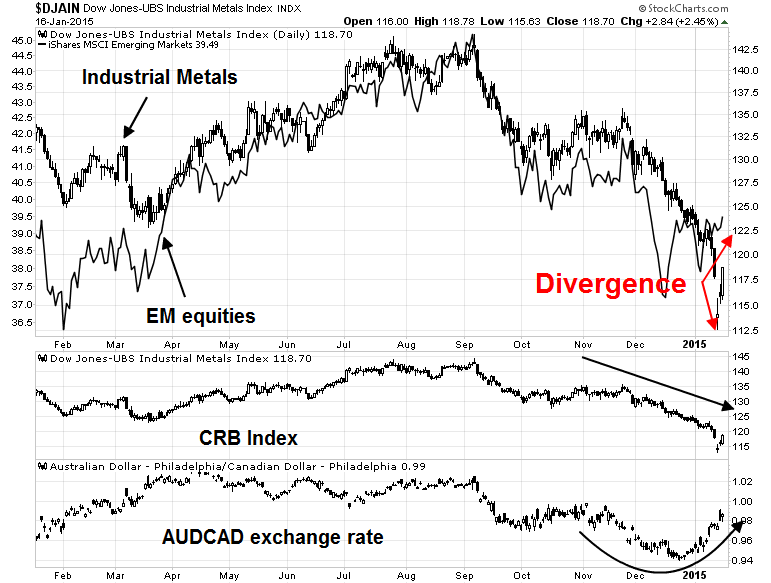 EM equities have been very correlated to industrial metals, but the latest divergence where EEM has rallied while industrial metals have continued to tank may be an indication that the de-financialization of commodities is beginning. Observant investors will recall that a number of institutions committed funds to commodities several years ago on the basis that their returns were uncorrelated to other assets. This led to the financialization of commodities as an asset class and pushed up prices. As commodity prices have begun to falter, we may be seeing the start of a de-financialization trend where investors exit their commodity investments. The bottom panel of the AUDCAD exchange rate is another sign that Chinese growth may not be as bad as many people expect. Both Australia and Canada are major commodity producing countries, but Australian exports are more sensitive to Chinese growth while Canada is more sensitive to US growth. The rally in the AUDCAD is another indirect indication of a turnaround in the Chinese growth outlook. In the US, the Fed is getting ready to raise interest rates in 2015 as economic growth has begun to liftoff. Despite the dismal retail sales number announced last week, there are signs that the American consumer is ready to drive the economy. First the blowout UMich Sentiment figures can be thought of an antidote to the retail sales miss. 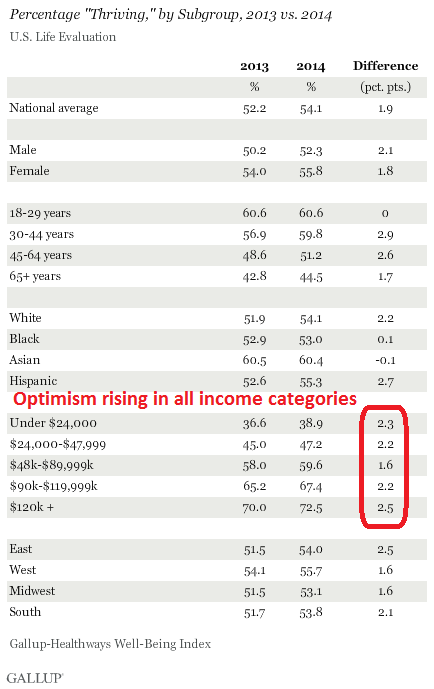 Gallup produces a rolling survey series of economic confidence and employment. 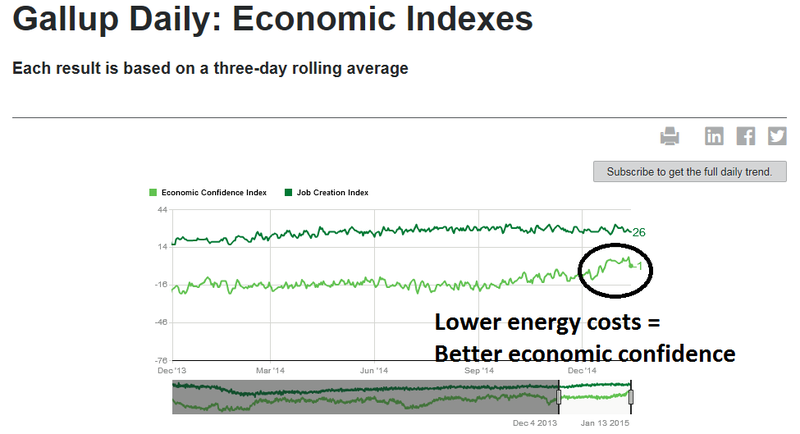 As the chart below shows, economic confidence shot up in December just as energy prices tanked. 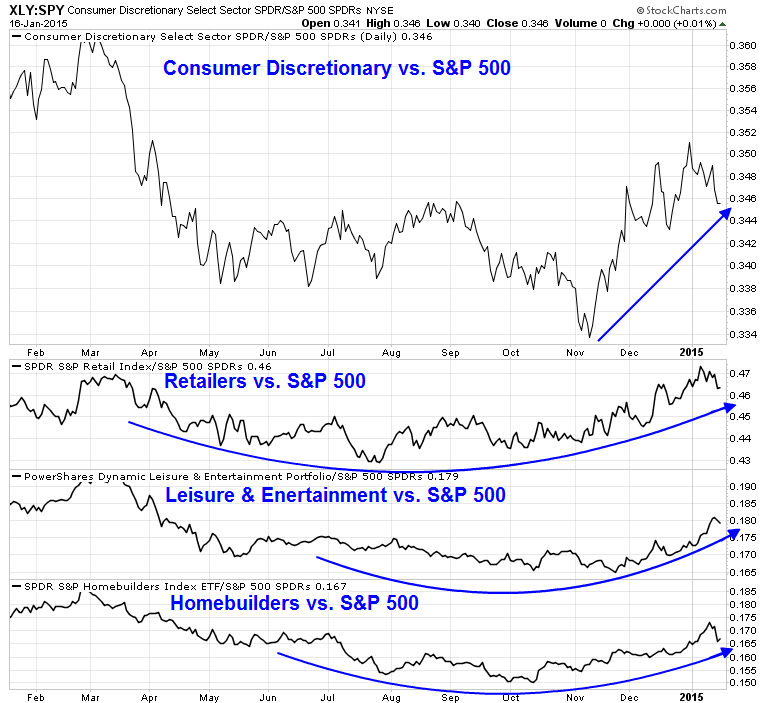 The chart below shows the relative performance of Consumer Discretionary stocks to the market, as well as the relative performance of industries that are sensitive to consumer spending. Taken together, these form a picture of a resurgent/ consumer and continued economic growth. In the meantime, many of my short-term indicators show that the risk/reward is skewed to the upside. 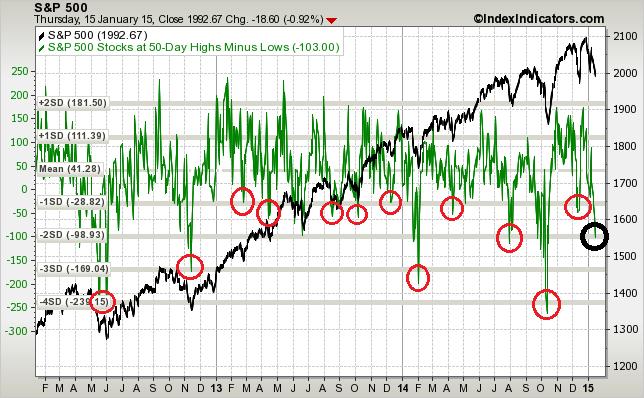 As an example, this chart from IndexIndicators.com show the 50-day highs-lows. This indicator is highly oversold and it is at or below levels where the market has bottomed out in the past (circles are mine), though there is no guarantee that the market can`t get more oversold from current levels. The chart below shows past signals in the last three years marked with vertical lines. 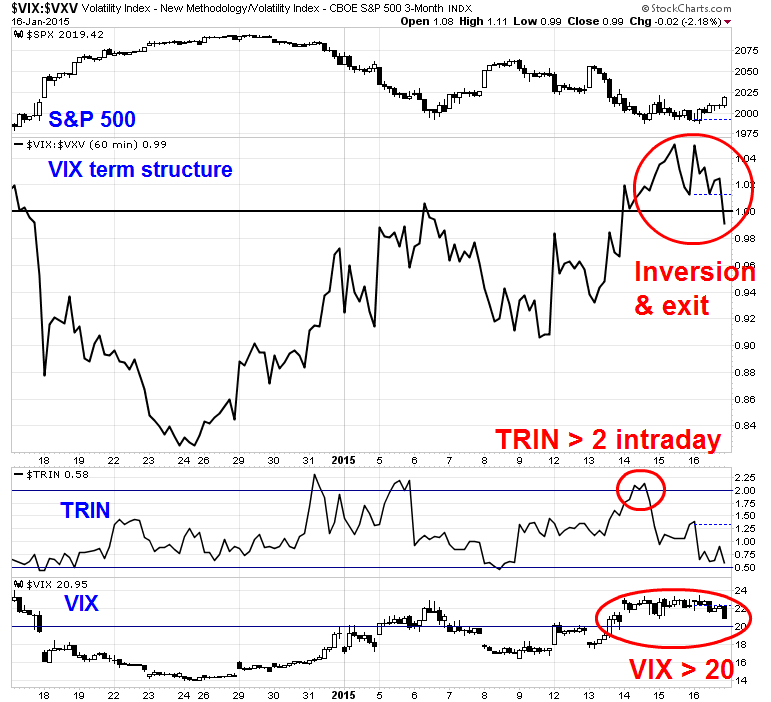 Last week, we saw two of the three signals and may have seen the third, namely TRIN more than 2. While TRIN did not close above 2 at any time during the last week, this hourly chart shows that TRIN did move above 2 on an intra-day basis on Wednesday. I have mentioned in the past the Stock Spotter site of John Ehlers and Ric Way. They make use of cycle analysis to generate buy and sell signals for individual stocks and ETFs. Notably, they publish their track record of signals and have done well overall. I note that, as of yesterday's close, they had 138 buy signals on stocks. Since late 2013, when I began tracking the service, there have only been five occasions in which we've had 100 or more buy signals. It's a small sample, to be sure, but all five occasions were higher in SPY five trading sessions later, by an average of 1.59%. Indeed, when we divide the buy signals by quartiles and look at the highest quartile (most buy signals), we see an average next three-day gain in SPY of +.33%. The lowest quartile (least buy signals) yields an average next three-day gain in SPY of +.06%. This is clearly not how John and Ric designed the service to be used, but I do find it interesting that the broad market has tended to perform best when individual stocks are giving the greatest number of buy signals. The top chart depicts a ten-day moving average of all stocks across exchanges making three-month new highs vs. lows. That breadth has been deteriorating since late October, but notice also that this week's price lows saw fewer shares making fresh net new lows than at the mid-December bottom. For that reason, I'm viewing the market as a range one defined by the December highs and lows. The middle chart takes a look at the balance between buying pressure (upticks) versus selling pressure (downticks) across all NYSE shares. Note the recent intensity of selling pressure ahead of price lows, followed by Friday's buying surge. This is a pattern that has been common at intermediate market lows and is consistent with the range perspective noted above. Finally, in the bottom chart we see the 10-day average of changes in shares outstanding for the SPY ETF. This has been an excellent sentiment gauge, as we have tended to see expansions in shares outstanding when traders have been bullish and contractions in shares outstanding when traders and investors have been bearish. We finished 2014 with considerable bullishness and recently have swung to the opposite extreme, again consistent with the range notion. In short, the stars are lining up for a short-term stock market rally. The deflationary storm spooking the market is abating, which should be supporting of the risk-on trade. 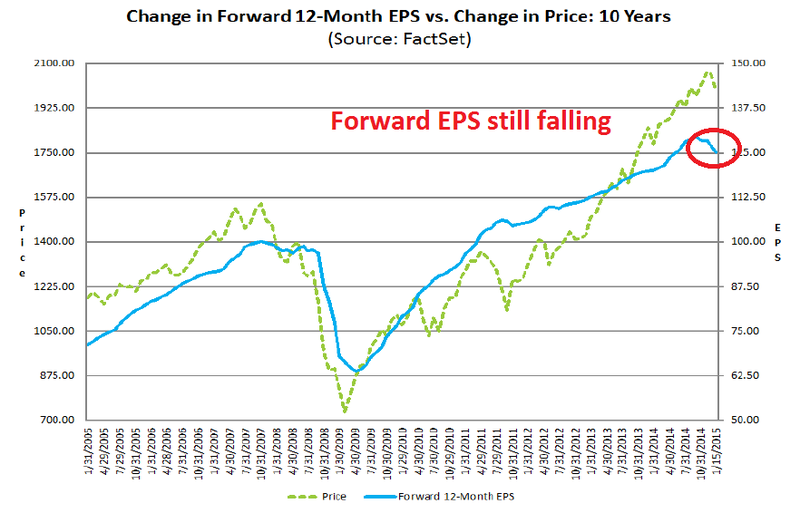 As the chart shows, past episodes of weakness in forward EPS have been associated with market weakness. While I fully expect forward EPS to start rising again as Earning Season progresses, largely because of greater optimism from the American consumer, it hasn`t happened yet. My inner investor is therefore neutrally positioned with an asset mix equal to his policy position mix of stocks and bonds. My inner trader remains bullish on stocks. It's decision time in the eurozone, at a whole host of levels. From a technical viewpoint, the Euro STOXX 50 is forming a wedge and I am watching for the direction of the breakout. European Central Bank President Mario Draghi will get a legal readout tomorrow on a predecessor to the quantitative easing plan that he’s set to reveal later this month. An adviser to the EU Court of Justice will say whether the European Central Bank’s Outright Monetary Transactions program overstepped the law in a non-binding opinion that may signal whether QE must also be reined in. To QE or not QE? The European Central Bank (ECB) could be ready to announce a quantitative easing (QE) program based on the contributions made from national central banks, a source close to the central bank has told CNBC. The source said that the central bank is planning to design a sovereign debt purchase program based on the paid-in capital contributions made by euro zone central banks. Every national central bank pays a certain amount of capital into the ECB. For example Germany pays in 17.9 percent of the total contributions, while France contributes 14.2 percent. Cyrpus, meanwhile, pays the least with 0.15 percent of the total. In Greece, the latest polls continue to show Syriza winning a plurality of votes at the January 25 election. Prime Minister Samaras’ New Democracy has not been able to close the 2-3 percentage point lead. Even with the 50 bonus seats given to the party that gets the most votes, it appears Syriza may not secure a majority in parliament. If it fails to do so after three days, the party with the second highest vote count will get a chance. New Democracy may be able to do so, avoiding another election. I would note that the SPX is already forming a wedge formation similar to the Euro STOXX 50. Given the kinds of deflationary winds emanating from Europe, it may be eurozone developments that drive the next direction in the stock market, rather than Earnings Season in the US. So instead of just watching US stocks, savvy investors and traders might be better served by watching Europe. The adults are back at their desks. Sell?